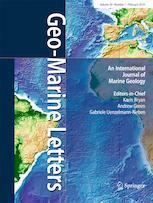 Geo-Marine Letters is an international peer-reviewed journal which offers rapid publication of concise original studies and reviews dealing with processes, products and techniques in marine geology, geophysics, and geochemistry. Coverage spans structural geology, including plate tectonics of recent active and passive margins; sea-bed morphology, physiography and morphodynamics; sediment transport, depositional processes and sedimentary facies analysis; stratigraphy, basin analysis and paleo-environmental reconstruction; sea-level history, paleoproductivity, gas hydrates, salt domes and brines; sediment-water interaction and organism-sediment relationships; geochemical tracers, stable isotopes and authigenic mineral formation; geotechnical properties and application of new geo-marine techniques, and more. In addition to regular articles and review articles, Geo-Marine Letters welcomes contributions by guest editors in the form of conference/workshop proceedings, or bundles of papers dealing with specific themes.